From newborns to 101 years of age, Dr. Haschets has 25 years of experience treating people of all ages. He has treated Pastors, Lawyers, Homemakers, Students, Coal Miners, Athletes, Teachers, Hair Dressers etc. Simply put, if you have a spine, Dr. Haschets can treat you. Some Chiropractors only treat the neck whereas others only treat the spine. Dr. Haschets has a whole body approach to treating his patients and has years of experience treating every joint in the body as well as various muscle and ligament conditions. We have great results treating headaches, neck pain, carpal tunnel syndrome, plantar fasciitis, ankle pain, sciatica, shoulder pain and back pain. 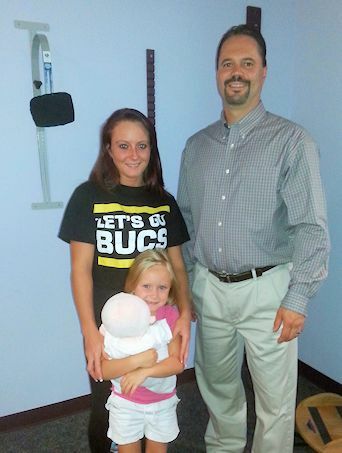 Dr. Haschets has experienced numerous injuries himself and he knows what pain is all about. Chiropractic has kept him functioning and working hard since he was 17 years old. He only wishes that he started going to the Chiropractor from birth. Dr. Haschets feels that God gave him great talent to treat his patients but unfortunately he was not given the ability to predict the future. Telling a patient "how long" is difficult to do and in most cases is just a guess. Some peoples symptoms are resolved overnight and others take a long time. Our goal is to get positive symptom relief as fast as possible by correcting the problems that caused the symptoms in the first place. We will never suggest that you return for our benefit. We are not one of those offices that suggest that every single patient is seen three times for the rest of their life...we promise.